Homecourt advantage for the first round of the NBA playoffs switches Thursday night to the advantage of the lower seeds. 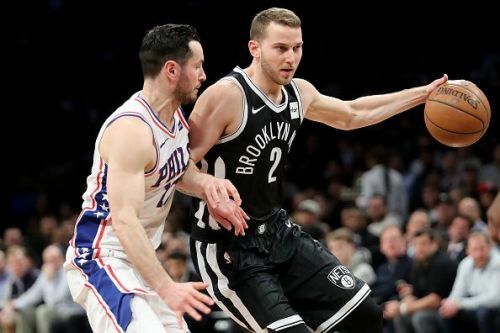 The young Brooklyn Nets, who are also the underdogs in these 2019 playoffs, broke even on the road against the favored Philadelphia 76ers and the series is now tied 1-1 after two games in Philadelphia. The Nets struck first winning game one 111-102 but followed that up with a 145-123 loss in game 2. In game one, the Nets were able to take passing lanes away so that Philly’s best shooters could not receive the ball. Joel Embiid probably still suffering from knee pain was not dominant in the post and played on the perimeter. However, in game two Brett Stevens was able to get his 76ers to make the necessary adjustments and they blew out the Nets. On Monday night, the 76ers got balanced scoring that they did not get in game one starting with Ben Simmons' triple-double of 18 points 12 assists and 10 rebounds. Joel Embiid was more effective in the post scoring 23 points and all thirteen 76ers players scored in their game 2 victory. Brett Stevens will start Joel Embiid, Tobias Harris, Jimmy Butler, J.J. Reddick, and Ben Simmons. The Nets will start Rodions Kurucs, Demarre Carroll, Jarrett Allen, Joe Harris, and D’Angelo Russell. Clearly, the 76ers made great adjustments to counteract the aggressive defensive performance of the Nets from game one in game two. It is of paramount importance that, defensively, the Nets slow down Ben Simmons and do not allow him opportunities to run fastbreaks or get scoring opportunities in transition. In game one, the Nets held 76ers’ starters Harris, Reddick, and Ben Simmons to just 18 points. However, in game two the same trio combined for 54 points while Simmons also had 12 assists. The Nets also need more offensive contribution from their starters. In Game two, the Nets got 80 out of their 123 points from their bench. The only Nets’ starter to score in double figures was D’Angelo Russell with 16 points. The 76ers shot the ball extremely well in game two. They were 56.1% from the field and shot 39.1% from the three-point arc. This was a massive improvement in comparison to game one where the 76ers shot just 40% from the field and 12% from three-point range. For the 76ers offense to be effective, two things need to happen consistently. Ben Simmons must get dribble penetration in transition, on fastbreaks and even in halfcourt sets were he has options to attack the rim or pass to open shooters when defenders collapse around him. Also, Joel Embiid must be active in the post offensively as he was in game 2. The 76ers won the battle of the points in the paint with 62-48. The 76ers will need to be more intense defensively moving deeper into the first-round series. They allowed the Nets to shoot 47.8% from the field and over 41% from the three-point arc in game 2. Granted, most of that hot shooting came from the Nets substitutes in the second and fourth quarters of game 2 when the game was mostly out of control. The Nets and 76ers combined for 268 points in this playoff game. There was not a lot of defensive highlights in game 2. 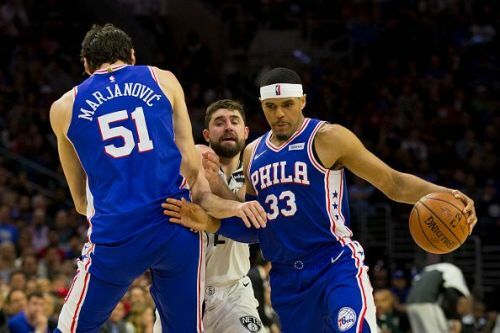 Now that the series shifts to Brooklyn, the third seed 76ers will have to stick to their game plan and be willing to defend. 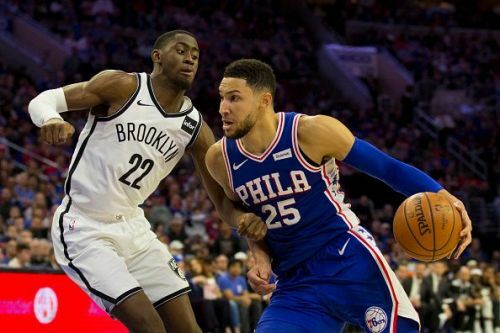 The 76ers were just 20-21 on the road in the 2018-19 season and the Nets are young, inexperienced, but play hard even when they play poorly. Game three of this series will not be easy for the 76ers and expect a victory for the Nets by a slim 5 point margin.